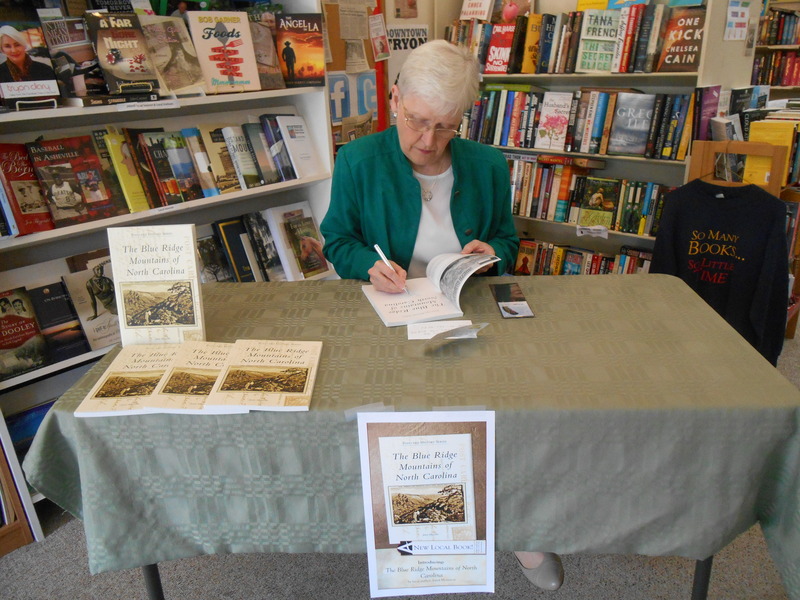 Saturday afternoon I had the privilege of having a book signing at The Book Shelf in Tryon, North Carolina. 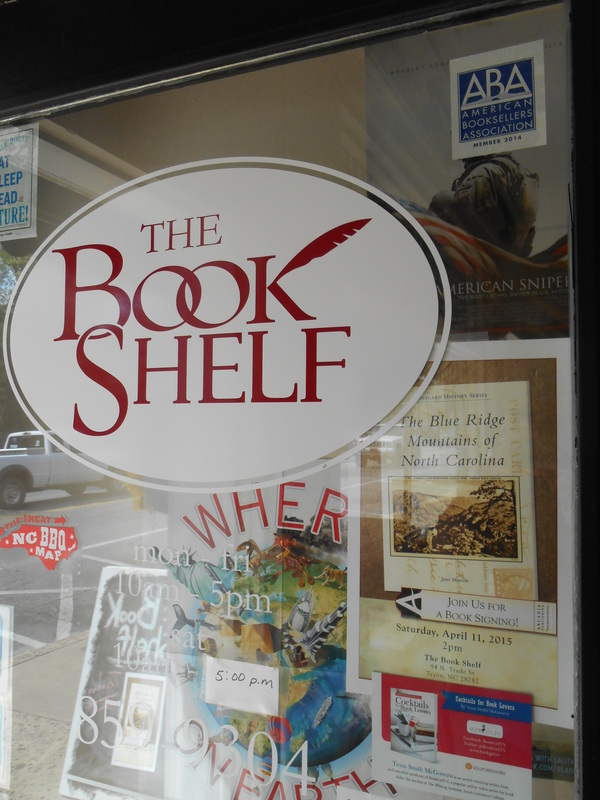 Penny Padgett, the owner had issued the invitation when I stopped by her independent bookstore in December to promote my vintage postcard book, The Blue Ridge Mountains of North Carolina. 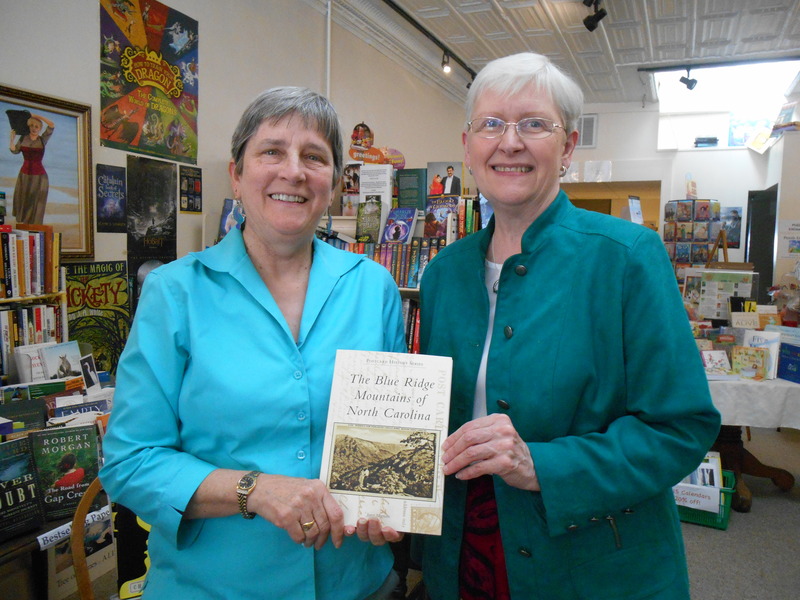 Janet with Penny Padgett, owner of The Book Shelf. It was a beautiful spring day and a delightful day to travel to the edge of the mountains. Tryon is a lovely little town just off I-26 in Polk County. The downtown business district includes a number of interesting shops. The Book Shelf has been there since 1952. Janet, autographing a copy of her book at The Book Shelf. After learning about my reading interests, Penny recommended three books to me, so I came home with three intriguing books — The Carolina Mountains, by Margaret W. Morley; A Passel of Hate, by Joe Epley; and The Road to Guilford Courthouse: The American Revolution in the Carolinas, by John Buchanan. I had the pleasure of meeting Susan McNabb, an author from Asheville who lives in Tryon. Joe Epley also lives there, as do a number of other writers. It was exciting to see young readers and middle school readers come into the bookstore and search the shelves for treasures to take home. It warms my heart to see children and youth who love to read! Lunch at The Lavender Bistro, just a couple of doors from The Book Shelf on Trade Street was just as enjoyable as it was in December. If you are looking for a nice day trip, or somewhere to eat lunch and shop in a nice bookstore on your way to of from the mountains, I highly recommend that you get off the interstate and spend some time in Tryon, North Carolina. Front door of The Book Shelf with a poster promoting my book signing.